2017 Hyundai Elantra SR Turbo: A Wheel Thing Car Review. | | A Wheel Thing. 2017 Hyundai Elantra SR Turbo: A Wheel Thing Car Review. 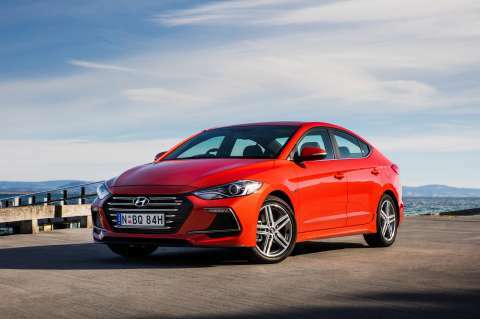 Take Hyundai’s 1.6 litre turbo four and wedge it under the slinky bonnet of the sweet looking Elantra, then allow the engineers to “play” with the suspension and you have the Hyundai Elantra SR Turbo. There’s a manual at $28990 and the auto at $31290, with both plus ORCs. A recent facelift has the Elantra looking lower and sportier than before, complete with longer looking rectangular styled HID Bi-xenon headlights backed up by a coupe style rear that hides a bigger than expected boot at 458 litres (seats up). 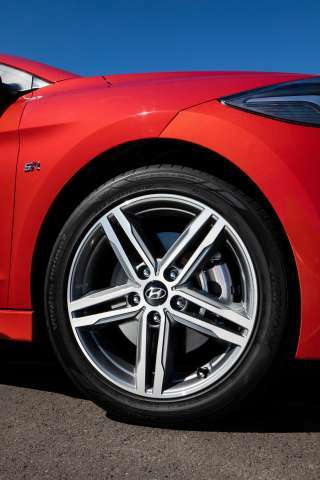 There’s 17 inch wheels which look, oddly, too small for the Elantra even though the wheel wells are filled. Twin scallops along the side have the effect of visually slimming the Elantra in profile and also somehow shortening the car. At the front, there’s the now familiar full face grille, hiding the only Turbo badge to be seen and drawing the eye to the car’s 1800 mm width. The tail lights have the inserts now familiar to buyers of the brand and its sibling, Kia. There’s subtly integrated side skirts, extra chrome in the front bumper and handsome ten spoke alloys with 225/45 rubber to complete the picture. All up, it’s possibly the prettiest car in the Hyundai fleet. Inside, it’s a mix of “do like” and “badly needs an update”. 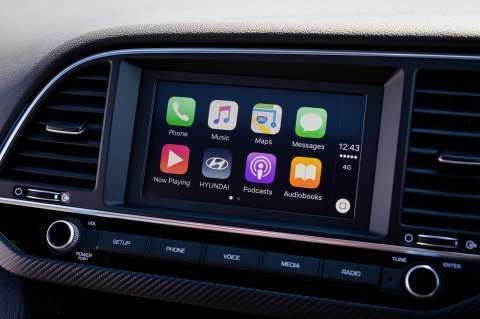 Hyundai persists with the quaint and outdated notion that radio listeners don’t need extra information and, as a result, there’s no RDS or Radio Data Service available. Neither is DAB, nor has the seven inch screen been updated to a more modern look when on the radio screen, and now looks woefully outdated compared to the opposition. There’s also no satnav, to compound the situation further and just the driver’s window, instead of all four, is one touch up and down. The rest of the dash and console design are familiarly Hyundai and here an extra splash of colour or black chrome would not have gone astray. Nor does the grey coloured faux carbon fibre sit entirely comfortably in the cabin. 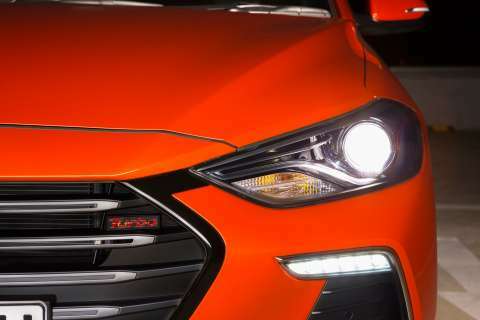 However, Hyundai have added a sports style tiller with a flat botton, well integrated audio and information controls, a subtle red stripe at the bottom of the wheel, paddle shifters and red stitching in the leather seats, with red leather available as a $295 option (but seriously, no cooling option for an Australian spec car???) and sunroof. Ancilliary controls such as those for the climate control are clearly laid out, easy to use and to read. To offset the perceived lack of what might be seen as basics in a chart topping car, such as adaptive cruise control and autonomous emergency braking, there’s front and rear sensors, blind spot detection with visual and audible warnings, cross traffic alert and lane change assist plus a knee airbag along with the other six. Although the screen looks bland and there’s no DAB, there are Android Auto and Apple CarPlay to be had. 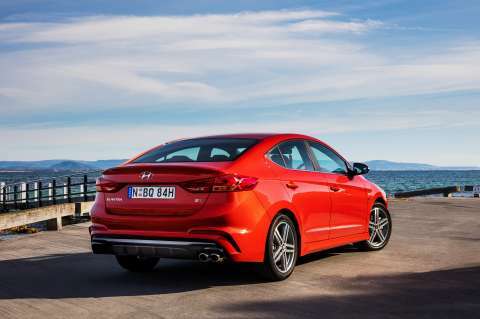 The seats are electric, supple and comfortable, supportive and gripping the body well, a necessity due to the European handling prowess of the Elantra SR Turbo sedan. There’s Sports embossed at the top, rather than a branding of the car with “Elantra SR”. The rear seats are less so, to a point, but there’s no shortage of rear leg room, thanks to the 2700 mm wheelbase. There’s 906 mm on offer, backing up the more than handy 1073 mm at the front. 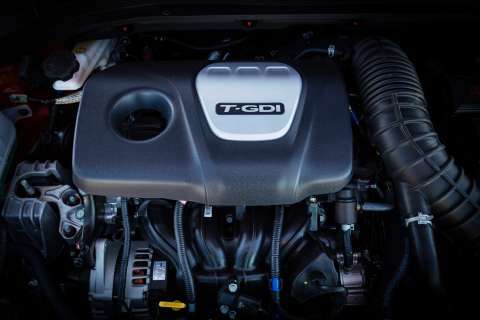 The Gamma 1.6L engine has a twin scroll turbo, outputting 150 kilowatts at 6000 rpm but the strength of the engine is the 265 Nm available between 1500 – 4500 rpm. 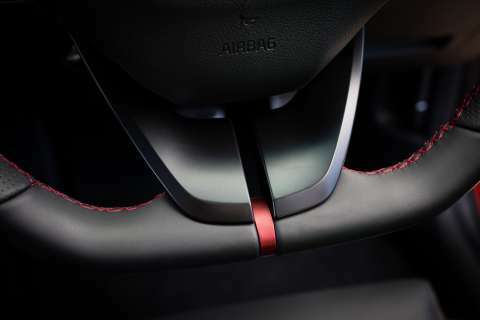 The test car was fitted with a seven speed DCT or Dual Clutch Transmission, and a manual is also available. The auto exhibits many of the traits that mark a DCT, being creep just off idle, a slight hesitation from standstill before engagement and an exhilarating bang/bang/bang through the gears when the engine’s ability is exploited. Exploit, if you will, but consider around town Hyundai says 9.5L per 100 kilometres from the fifty litre tank for consumption. Under light throttle, the seven speed auto sometimes dithers, with characteristic DCT prevaricating; press a little harder and the changes sharpen up, with a quicker response. Harder still and changes are slick, more urgent, virtally unnoticed to those inside apart from a flick of the tacho and a crisp “phut, phut” from the twin tip exhaust. There’s an instant answer to any question the right foot asks when underway and that 3000 rpm rev range of torque makes magic on the road, helped by a kerb weight of 1415 kilos for the 4570 mm long sedan. There’s also magic underneath, with perhaps one of the best handling packages going in the class and price point Hyundai have positioned the Elantra SR Turbo in. It’s taut and crisp, yet forgiving. Tight, yes, yet an astounding amount of compliance without any feeling of isolating the driver from the feedback the chassis offers is felt. You could run over a five cent piece and be able to read what year it was made, such is the tactility of the system. Hit a car park speedbump and the rebound is instant and instantly damped out. On long sweeping corners, the SR Turbo is flat, composed, but will wiggle sideways momentarily when a rippled or broken surface is crossed. That 458 litres of boot space is only slightly compromised by the shift to a proper independent rear end, instead of the normal torsion beam rear, with a space saver spare instead of a full sizer. It’s matched by a well weighted and surprisingly not over assisted steering system, fettled by Australian engineers. There’s plenty of feedback and response from the front, with a direct response to driver input. It’s only in tightening radius corners where a hint of understeer creeps in. Warranty wise, Hyundai have given the Elantra SR Turbo the standard five years/unlimited kilometre coverage and if you get your vehicle serviced by Hyundai you’ll be rewarded with ten years free road side assist. The car is also covered by a lifetime capped-price service campaign, with maintenance due every 12 months or 10,000 kilometres, whichever occurs first. The average cost per visit over 60 months/50,000km is just $295. Be the first to comment on "2017 Hyundai Elantra SR Turbo: A Wheel Thing Car Review."